Since there is a bit of a nip in the air and the leaves are beginning to turn... I thought I'd share with you some of the things I'm enjoying this Fall. I've even included some links for you to check things out further. This is not sponsored (but gosh, it should be!) these are just things that make me happy. First on my list is the word "autumnal". I get really irritated when people say, "autumnish" or "autumny" or "fall-like" because we have this amazing word "autumnal" that just rolls of the tongue so beautifully! I challenge you to incorporate it into your vocabulary today. It makes you sound really smart! Obviously I also enjoy all the autumnal things that are happening like the weather getting cooler and the aforementioned changing of the leaves... but having a perfect way to describe them is also tops in my book! Most of my likes are food because I am not a person of many vices so forgive me if there are a lot of food related favorites. 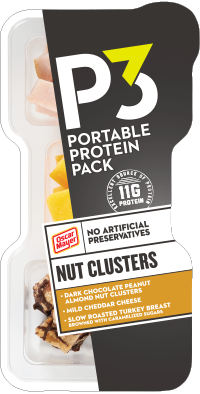 One thing I'm really enjoying is Oscar Mayer's P3 Portable Protein Pack. I have a hard time preparing food. Usually by the time I've put a meal together, my pain level is too high for me to enjoy it. Or... if I'm busy, like on a Daddy/Cosy day, it's hard for me to eat much because pain + food = seeing the food a second time. What works best for me is having a tiny little bit of protein to keep my energy up. Most portable food is carb-ish (carb-tumnal?) so I am happy when I find easily accessible protein that I enjoy. These little guys are yummy and cheap - about $1.50 each at Walmart. Of course there are times that I want something more substantial like a big, juicy steak but for the other 99% of the time, these are perfect. My mom can eat them because they're lower carb so they don't mess with her blood sugar too much. Another quick pick me up are the Shoreline Fruit dried cherries that we got in the food giveaway that our church does every month. Pop works the giveaway and the workers get the leftover food so that it doesn't go to waste. We got these huge bags of dried cherries about a month ago and they were so YUMMY that I had to do some research to find out how to replace them when we run out! I throw them into my oatmeal while it's cooking and they plump up. It tastes like cherry pie oatmeal! I also just eat them by the handful when I need a bite of something sweet. 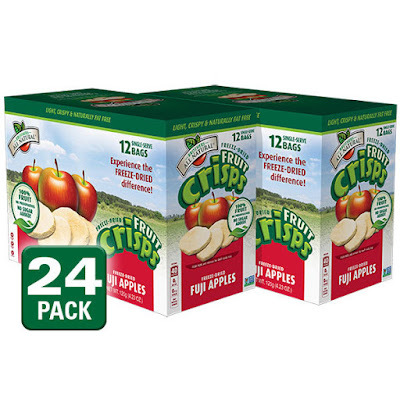 Along the same line... one of my go-to foods for Cosette is the Brother's freeze dried apples. She insists on feeding herself and since we don't have a high chair that can be a messy proposition. These little bags of apples are very light and easy for her to carry. They taste good (I eat them almost every day myself) and they're real fruit without junk added to it. Each little bag is two servings of fruit which is a huge amount to get into a toddler belly. Cosy eats the plain apples - they also have cinnamon flavored apples but that's not toddler friendly. This week she also tried strawberry and banana and seemed to like them just as much. Honorable Mentions in Favorite Foods: My trusty PSLs - pumpkin spice latte's from Starbucks. I know they're probably made of squash and not pumpkin. I know you can make your own at home for cheaper. I know... all the anti-PSL things but for me, it's a lovely treat once a week or so. Also, still loving the Gold Peak Peach Tea. These ARE a Starbucks replacement for me - replacing the peach black tea or the mango green tea that I usually buy at Starbucks in the non-PSL parts of the year. I can get a gallon of Gold Peak for the same price as a trente sized Starbucks tea. Cons - must provide my own ice and cup, affordability and availability results in overindulging but... I love my peach tea. Cosette's favorite protein is string mozzarella cheese. We buy the kind in Frozen packaging because - marketing. 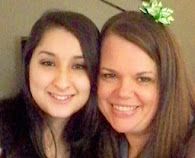 In non-food favorite things - first on the list is my Otterbox phone protector. I have an iPhone 6s - with no plans to upgrade any time soon. I also have two tech-savvy grandtoddlers who love phones. Because I am an indulgent Nana, I am generally willing to allow the babies to have access to pretty much anything that is not harmful to them, including and not limited to my phone and digital camera. This means that my phone needs as much protection as humanly possible. I was using an Otterbox Commuter Series cover but the phone got dropped and it chipped a tiny piece of the Otterbox - not the phone - right by the camera lens. I got on the internet ASAP and bought a replacement and upgraded to the tougher Otterbox Defender Series. When I got the first cover there weren't little hands on my phone and I only had to protect against my own clumsiness (and the cat's vindictive tendencies to toss things off of my end-table). I chose pink with a blue interior for my cover and I love it! When the phone hits the ground I don't even blink! We have paid about $40 for the cover in Walmart (for Austin's) but I found my replacement on Amazon last week for $20! Maybe because of the iPhone 7 being out? Not sure. Other favorite things right now... Florida State Football - and college football in general. It just makes it FEEL autumnal to sit and watch football on tv. I'm also loving the Disney Emoji Blitz app which lets you earn Disney emojis for your phone by playing the game. I'm obsessed. I found out this week that I wasn't even using all the features of the game (so technologically deficient) so now it's waaaay more fun than it was before! Cody and Marquee and Sarabeth and Jamie are all also playing the game so it's fun to compare emojis. I started watching the New Girl tv series on Netflix this week and I'm finding it a light-hearted distraction. Not the best thing I've ever seen but it beats the heck out of 24 hours a day of election coverage. Wow! SO MANY THINGS! And I could honestly easily name another dozen things I'm loving right now! I'm interested in knowing what your current obsessions are... my mom is into the adult coloring books and has amassed quite a collection. My dad continues to be all about golf. Austin ... hmmm... not sure what he's into right now. Staying employed, I guess. Leave me a comment on here or on Facebook and share your favorite things with me! Love and hugs y'all!